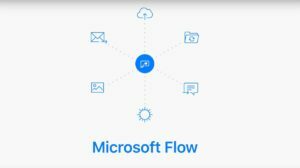 Microsoft Flow is one of the newer additions to the Microsoft family. Simply put, it’s a workflow automation platform that allows you to connect different apps and services to each other. Flow integrates with many existing Microsoft Office apps (e.g., SharePoint), as well as other popular workplace software, such as Slack and MailChimp, to help you get more work done in less time. Let’s take a look at what Flow brings to the table of cloud productivity. Personal productivity drives organizational productivity, which has been the core focus of many recent workplace applications. Microsoft responded to this rising consumer demand by creating Flow, an app to “Create automated workflows between your favorite apps and services to get notifications, synchronize files, collect data, and more”. This gives you more time to focus on your core business strengths rather than on a variety of different apps. The application connects with existing SaaS platforms to create a smooth workflow, ensuring that you don’t miss out on anything. 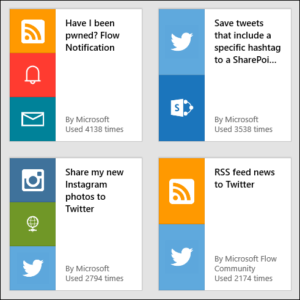 If you have experience working with IFTTT (If This Then That), then think of Microsoft Flow as IFTTT customized to meet your specific demands. 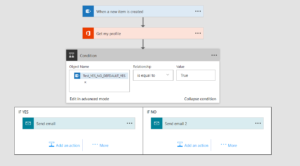 Microsoft Flow allows users to create workflows (“flows”) that are based on trigger events. For instance, users can create a flow that downloads responses or replies to an email, and then uploads those messages to Dropbox at set intervals. It can also download every Tweet that’s sent from your business account to an Excel file and save it to Dropbox. installed—Flow was automatically added to the Office 365, Microsoft 365, and Dynamic 365 application suites. After you’ve signed in to Microsoft Flow, all you need is a web browser, Microsoft 365, and a valid Microsoft email address. Microsoft Flow supports all versions of Chrome and Safari, in addition to its native browser, Microsoft Edge. There are many trivial tasks that are undertaken every day. With flow templates, all you need to do is define a set of rules for automated ‘flows’ that will complete these trivial tasks for you, saving precious time. For instance, Flow can automatically notify you on Slack when your director emails you on your Gmail. Flow templates are simply predefined ‘flows’ for common processes; they’re defined in Microsoft Flow’s database and made available to all users. So instead of rushing to create your own flow and reinventing the wheel, be sure to check out the existing templates first. Even with the plethora of available templates, Microsoft is continually introducing new ones. Additionally, Flow templates created by other users are frequently added to the list of general templates. It’s quite easy to create a Flow template; the only challenge is connecting the template to your Microsoft Flow account. Specify the frequency of the template being run. Type in the content of the template. Connect the account on which you want to receive the file, reminder, etc. Templates can be customized to meet your needs. For instance, when creating a flow for a recurring action, you can specify your time zone; workflows pertaining to emails can also be modified to trigger on the occurrence of specific events, such as holidays. If you’re accessing the app using Microsoft Office 365 or Dynamic 365, you’ll find that different plans are equipped with different versions of Microsoft Flow. If you intend to use Microsoft Flow without Office 365 or Dynamic 365, there are two versions available: a free version and a paid one. The latter is further divided into two pricing structures. Each pricing plan allows for a certain amount of runs per month. A run is counted every time a flow is triggered either automatically or manually. The free, basic plan comes with the option to create unlimited process flows. However, this plan is only for single users rather than an organization. Users are only allowed 750 runs per month in this plan; the system conducts checks every 15 minutes. This paid plan costs users $5 a month. You’re allowed 4,500 runs per month with checks every three minutes. This plan allows premium users to connect with services such as MailChimp, Oracle, and Salesforce, to name a few. 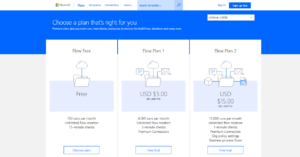 Flow Plan 2 is the most expensive—and therefore the most advanced—plan offered in the Microsoft Flow catalog. The plan costs $15 per month and allows users up to 15,000 runs per month with the check frequency reduced to 1 minute. With it, you have access to the same premium business services as under Flow Plan 1, but this plan lets you access and modify organizational policy settings and several business process flows. Not sure if Flow is right for your work processes? There’s a 90-day free trial for the paid versions—enough to prove its worth to your business. What Can You Do with Microsoft Flow? Keep in mind that Microsoft Flow is designed for enterprise users. While the free plan lets you create unlimited flows, a paid plan will give you access to Dynamics 365 business process flows that further guide you on how to navigate the different steps for data entry, with the ability to trigger flows based on that data. Automated: A workflow designed to run automatically, based on the occurrence of an event—such as the receipt of an email, changes to a file, or an addition in the workspace. Button: A manually administered workflow, which only runs once a button has been clicked. Scheduled: A recurring flow; you can specify the frequency of the runs. In addition to custom workflows, Microsoft supports integration with a large number of applications for enhanced interconnectivity and efficiency. These include all Microsoft Office apps, as well as dozens of other third-party apps such as Slack, Dropbox, Twitter, Gmail, MailChimp, Jira, and Basecamp. For customized integration, Microsoft has enabled connector protocols like FTP and RSS, meaning you can also connect your preferred applications. Microsoft Flow is a glance into the promising future of the cloud. With interconnected apps and automated workflows, you can get more work done with less effort—and certainly less wasted time.